Buying a bed is a thoughtful process. Choose your bed and dealer wisely, you’ll be happy for years. Make a poor choice and you’ll regret it nightly. At Long’s we know how to guide a customer successfully through the process, resulting in years of restful sleep. Obviously, the opinions expressed are strictly those of Long’s. The bed should mold to every curve of the body, no matter what the sleeping position. 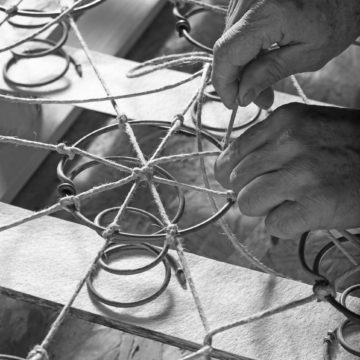 The best constructions are still the 50-year old ones, made by hand and filled with natural fibers. Innerspring, pocketed coil, hand made. One to three layers of hand nested coils encased in cotton muslin. Filled with natural, hand-teased fibers. Least amount of motion transfer. 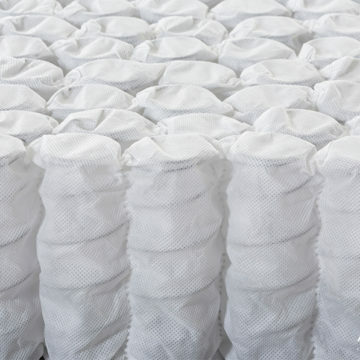 One layer of individual coils encased in non-woven fabric. Can be upholstered in natural, synthetic or a combination of fibers and foams. Least amount of motion transfer. Open coils, wired together to ensure a very firm feel. Found in luxury to budget mattress. A comfort preference. Slight motion transfer. The best foam for sleep. Natural (not mixed or synthetic), made from rubber tree sap and water. Unlike synthetic foams, latex has zero heat retention and will not effect ones body temperature. Molds to the body better than any other foam. Least amount of motion transfer. Hand teased natural fibers mold to the body luxuriously. Cool in summer; warm in winter. Found in luxury to affordable beds. Better quality foams mold to the body nicely. Quality types are vegetable based to add coolness and luxury. A three or four inch solid cotton border, hand side stitched is the finest mattress edge. Enables edge to edge sleeping and will not collapse, Found in luxury beds. 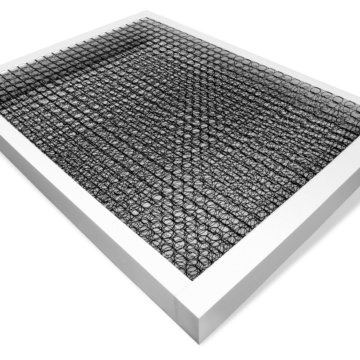 Foam encased borders are reminiscent of cotton and used in more affordable, quality beds. 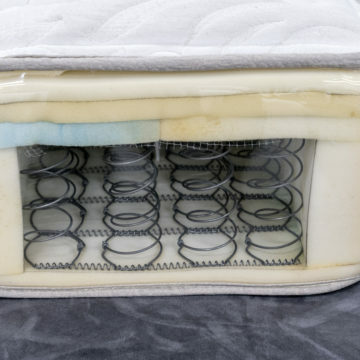 Outer tufting (a double thread running top to bottom through the mattress and secured on each side), keeps all of the filling materials from shifting, helps the bed conform to the body better, while adding years of life to the mattress. Found in mattresses at all price levels, made by quality oriented manufacturers. Two Level Hand Tied Spring Bottom, Pocketed Coils on top, hand side stitched and outer tufted. The finest. 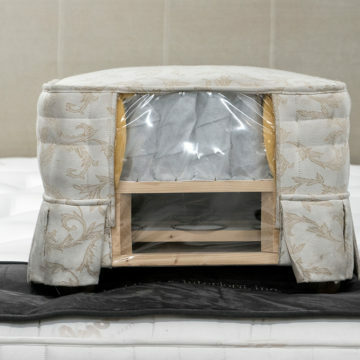 The Box Spring (or English Divan) acts as a shock absorber for the mattress, enabling both pieces to work together in conforming to a body’s curves. Found in the best American beds. 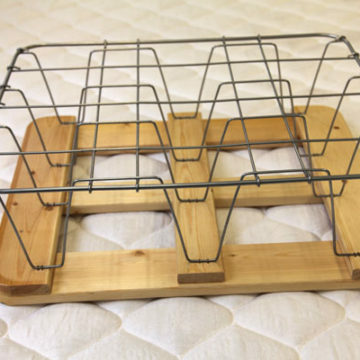 Acts as a shock absorber to ensure both mattress and box spring work together to conform to the body. Helps the mattress mold. More rigid than hand made. Give a firmer, less flexible feel. Best for latex foam beds. Used on many innerspring for those who prefer firmness underneath. Determine your comfort level.Lie on different beds to see what appeals to you. Try them in every position you sleep in to make sure the bed hugs your curves. There should be a selection of comfort levels at every price point. Ask how it’s made. Ask what makes one bed more expensive than the other. Is there more true quality to justify the addition cost or just more profit for the manufacturer? Expect knowledgeable answers. One sided or two. 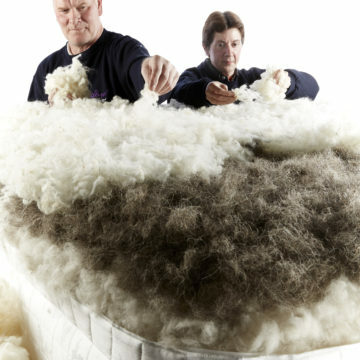 The majority of the bedding industry is producing one-sided or no-flip beds. However, we still love two-sided mattresses and get them whenever we can. A two-sided mattress offers double the life as the mattress can be turned to even out the wear and tear. 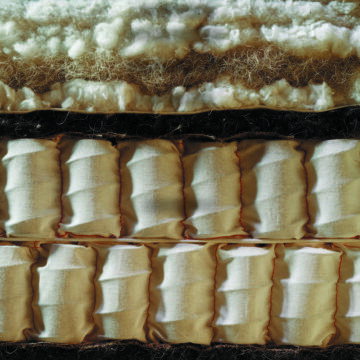 Mattresses filled with natural fibers tend to get body impressions, as naturals mold beautifully, just like fine shoes mold to the shape of the feet. 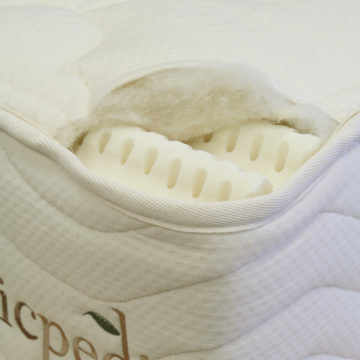 Turning the mattress allows body impressions to settle on the bottom while you are impressing the top. Mattresses filled primarily with foams don’t usually get many body impressions, working just as well one sided or two. It’s a personal choice and we have both. Ask about delivery procedure and service. Ask about the store’s right to substitute another make or model without your knowledge or consent. Obviously substitutes never happen at Long’s. Make sure a store doesn’t take old or used beds on their truck. Long’s will take old beds to the refuse area of the property they are delivering to, never on the truck to another locations. In this day and age of bedbugs, it’s a good policy. Ask about comfort guarantees. What happens to beds that a customer has tried in their home for a week, two weeks, a month or longer? It’s against most local health codes to ever deliver a bed as new that was returned by another customer. 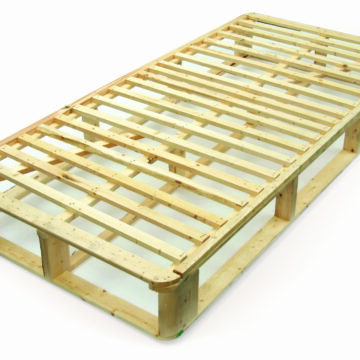 Most manufacturers will not accept a bed for return from a dealer if there is no manufacturing defect or a comfort issue. It’s not a problem at Long’s. We respect our customers and only deliver factory fresh products in factory sealed packing. The bed is not unwrapped until it reaches a customer’s home. It’s a matter of pubic record that businesses have been fined by state and local authorities for delivering used beds as new. Ask about warranty issues. Some manufacturers will offer a 10-year warranty on a bed designed to last 4 or 5 years. Mattress warranties cover defects that occur at the time of manufacture. In the event there is a problem, will the retailer handle it for you? Or are you on your own to fight with a distant company? At Long’s we’ll take care of it for you. We’re on your side. Beware of commission-driven sales people. Does the sales person truly care about your satisfaction, comfort, budget and particular needs? Or, does he/she just care about the extra commission they’ll receive for selling a particular product or model? At Long’s we’re a team. No one works on commission. Or, shop at Long’s. We’ve done all the work for you.